Can I have the same RSS Feed send on two different schedules? Comments Off on Can I have the same RSS Feed send on two different schedules? What if you have one blog, but you want your subscribers to be able to choose between Daily RSS emails and Weekly RSS emails? That’s totally do-able! Let’s assume you’ve already got your RSS to Email feature set up and working properly (if you need a hand setting that up in the first place, you can find directions here). 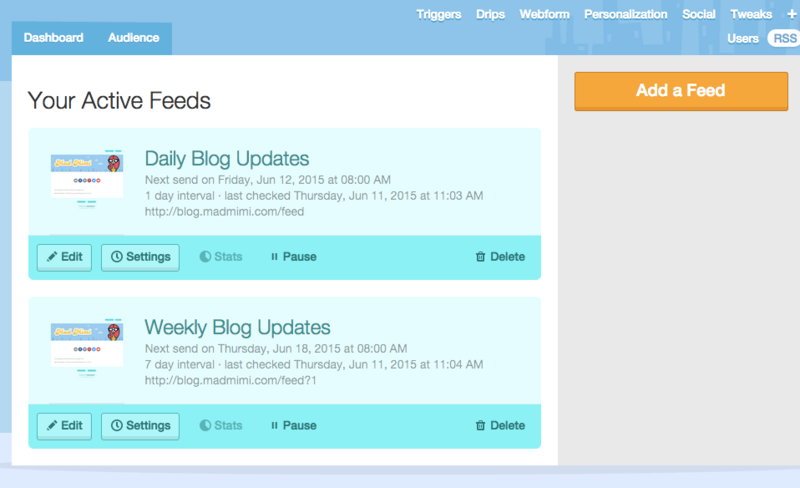 Now, you’ll have two different setups for the same RSS Feed. You can keep your original schedule intact, and schedule the second feed to send to a different list at a different time. For example, you can schedule http://blog.madmimi.com/feed to send new posts every day at a certain time, to a “Daily” audience list. Then, you can schedule http://blog.madmimi.com/feed?1 to send new posts every Friday, to a “Weekly” audience list. Note: If ?1 doesn’t do the trick, you can try adding #1 at the end of the Feed URL instead. It’s also a good idea to visit the amended URL to make sure the Feed loads correctly, before setting it up in Mad Mimi.